You might have watched advertisements on television saying tap water is unsafe, or use aqua-guard, a water purifying system in order to get water safe for drinking. Then they show various germs that are magnified and labelled as culprits for our bad health. Have you ever thought what these tiny monsters or germs are? Living organisms which are not visible to the naked eye are known as micro-organisms. These germs are microorganisms or microbes. They are the tiniest possible living organisms that are too small to be seen through naked eyes. They are living organisms that can be seen only with a microscope or a magnifying glass. Microorganisms were observed for the first time by Anton von Leeuwenhoek in 1674, using a microscope of his own. Is the water that seems to be clean, clear, and transparent safe for drinking? No! The water that seems to be clear and transparent is not always safe for drinking. It may contain some of the disease-causing microorganisms and other dissolved impurities that you cannot see with your naked eyes. However, if you view the water with the magnifying glass, you can see several microorganisms in it. Therefore, it is advised to purify the water before drinking. The purification can be done by water purifying system or by boiling the water. Microorganisms make up the largest number of living organisms on the planet. They are not just billions or trillions around the earth, but trillions of trillions and many more. There is a huge variety of microorganisms present on earth. There are five major groups of microorganisms that include bacteria, protozoa, fungi, algae and viruses. Can you tell what is the study of these microorganisms called? The study of microorganisms is called microbiology. Do you Know that these microorganisms can be cultivated in artificial media under certain conditions? There are many scientists who have contributed in the field of microbiology. Let us discuss about the contribution of some scientists here. He disapproved the theory of spontaneous generation of life. He proved this by his famous experiment known as swan neck flask experiment. Earlier it was thought that new life originates from non living things, but Pasteur disapproved this and established the theory of biogenesis. He developed the method of pasteurization to prevent spoilage of food by bacteria. He also contributed to the development of vaccines. Robert Koch developed the germ theory of disease that established the microbial cause of disease. He identified anthrax disease that infected cattle, sheep and even humans. He developed agar growth medium for the culture of microbes. Bacteria are the most primitive and diverse unicellular organisms found in living world. They are prokaryotic in nature as their genetic material, i.e. DNA, is not enclosed within a nuclear membrane. Because of their unique biochemical pathways and properties, they are of high economic importance to the human beings. Let us take a look at a general account of various features of bacteria. 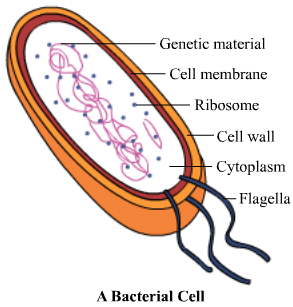 Bacterium is unicellular in nature, consisting of a cell wall made up of peptidoglycan, cell membrane and protoplast. The cytoplasm lacks any cell organelle, except vacuoles and ribosomes. DNA lies freely in the central region of the cytoplasm. In some cases, the cell wall is further surrounded by a slimy protective layer, called capsule. Some bacteria also contain whip-like flagella that help them in their movement. Bacteria are of different shapes. They can be classified in four groups based on their shape. (i) Rods: They are rod-shaped bacteria and are called bacilli. Examples are E.coli, Salmonella, and Clostridium botulinum. (ii) Spheres: They are round in shape and are called cocci. An example of cocci is Staphylococci. (iii) Spirals: They are spiral-shaped and are called spirilli. Examples are Vibrio cholerae and Treponema pallidum. Fungi is a group of eukaryotic, unicellular as well as multicellular, non-photosynthetic organisms that includes mushrooms, moulds and yeasts. These organisms have a rigid cell wall made up of chitin and are found in diverse shapes and sizes. Most of the fungal species are saprophytic in nature. Some of them are parasitic on various plants and animals as well. Most fungi reproduce asexually, though sexual reproduction may also take place in few cases. Asexual reproduction may occur in the form of spore formation (as in Rhizopus) or as budding (as in yeast).